You are here: Home » MEDIA » Books » American Comic Book Chronicles: The 1990s: 1990-1999 by Jason Stacks and Keith Dallas (book review). 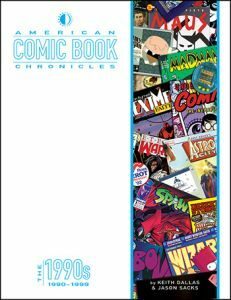 American Comic Book Chronicles: The 1990s: 1990-1999 by Jason Stacks and Keith Dallas (book review). Mid-way through the 1990s, my lack of funds cut short my comicbook collecting, although from the looks of things, it was probably at the right time. Having read ‘American Comic Book Chronicles: The 1990s: 1990-1999’ by Jason Stacks and Keith Dallas, this at least confirm that decision. What a mess of egos, corporate spin and failure that forgot the one important ingredient, the people who actually read comicbooks. Feeding what is thought to be a desire for multi-cover bagged editions, number ones and particular artists is incidental to a comicbook’s main purpose of telling stories. Even the nascent developing Internet didn’t have to try that hard to find distractions for people to spend their time. Don’t miss out reading the introductory pages about the problems of cover dates not being the same as when they were on the shelves. I would have thought that as they are all subject to the same time lag, the date validity would have been consistent. With the multiple covers of the likes of ‘Spider-Man’ and ‘X-Men’, you do have to wonder why Marvel didn’t play fast and loose and see if anyone spotted the junior comics content snucked away inside the covers because no one was surely to look. Actually, I did open up my bagged ones to read and no they didn’t. Even so, as I recall, not all the different covers were printed in the same quantity and the spread-out ‘X-Men’ cover certainly had a shorter run. Reading the events of 1991, amongst them was the Internet starting up, it was interesting contrasting the organised fashion Marvel had compared to DC Comics when it came to mega-cross-overs. Seeing the switch of Marvel being run to make money for stockbrokers in hindsight shows how bad a decision that was. I doubt if any publishing company can afford substantial growth every year, let alone in comics. Reading the mess and mass migration of artists from Marvel Comics to forming their independent companies in 1992 is going to look like something ready to happen no matter what attempts could have changed it. I think my reaction at the time was do we really need another bunch of super-heroes? Then that become multiple bunches of super-heroes and nary anything else. This wasn’t to say 1992 was productive but, even back then, I was starting to wonder if any comicbook fan was buying everything then that had to be very wealthy and the bubble had to burst. Seeing the information fully then and now, I think I would have been worried. It’s a lot easier to bunch the next few years together from reading here. An over-saturated market of multiple comicbook companies aiming for collectables tended to forget just who was buying their product. Even back in the time, I could see the market wasn’t going to last before something burst. Back in the 1990s, I could barely afford to stay up with the Big Two, let alone more companies dealing with super-heroes. My understanding of American business is all about deals and wiping out the opposition. Comicbooks were just the latest victim of such shenanigans with no desire other than to make money for the suits who would then move onto the next product with little thought to the damage in their wake. Looking back, I’m glad lack of money made me leave than see the mess that was to come. Am I repeating myself here? These were really turbulent years and I suspect any long-term comicbook readers like myself are going to find this rather upsetting. 1994 was a disaster year waiting to happen, although I learnt a lot about what happened to various companies and people, especially where their reputations went down the tubes. 1995 was also the year when I could no longer afford comicbooks, so it’s interesting seeing what happened to stories that I left in mid-stream. Comicbook sales weren’t the only casualty, the number of mainstream characters who died or relinquished their roles for other people to take their costumed identities was also rife. Shaking up the formula to get new readers ion a saturated market. Objectively and paradoxically, in many respects, comicbook readers share with other aspects of our genre a dislike of change and at the same time want some change. Go analyse that one. The comicbook companies felt themselves too bogged down with long histories of characters and felt new super-heroes under the same brand would change this as if this was why sales was dropping. I could ask one very easy question here: Which Spider-Man origin, sans films, can you recount the easiest? With 1996, reading the events here, it felt like the expansion of comicbook companies was ignoring the lack of sales and just ignoring what caused them to happen in the first place. It also reads like musical chairs where various people shifted their creations to different independent companies that made me wonder how their readers kept up, let alone knew where to follow them. Up to the last couple years, the previous years were hitting 40 pages each and down to 20 each on them became something of a relief. In many respects, this volume is going to make for some painful reading but necessary so we don’t see things like this ever happening again. Mind you, the authors have at least another volume to do to see what happened to the recovery. If you’ve been collecting the earlier volumes of these chronicles, you’ll undoubtedly want this one as well. I should point out that there are a lot of comicbook covers and interiors and plot synopsises. These are pulling out the highlights so don’t expect everything to be there but enough for you to make some decisions as to what you might want to check out. This edition is a heavy but important read of how comicbooks and their companies listened far too much to their investors and not to what actually made them popular in the first place. « In Like Flynn (2018) (a film review by Mark R. Leeper).